ORGANIZZATO E DIRETTO DA FRANCESCO MIGNOGNA IL FLASHMOB HA AVUTO COME SCOPO QUELLO DI CREARE 2 SEMPLICI MINUTI DI PURA SPENSIERATEZZA ED ALLEGRIA, NONOSTANTE IL MOMENTO NON PROPRIO POSITIVO CHE LA CITTA' DI TARANTO STA ATTRAVERSANDO. "I PROBLEMI CI SONO,VANNO AFFRONTATI,ED è GIUSTO LOTTARE PER ESSI,MA RITENIAMO SIA ANCHE GIUSTO LASCIARE SUL VISO DELLE NUOVE GENERAZIONI E DEI BAMBINI,QUEL SORRISO CHE ANCORA FA SPERARE TUTTI NOI IN UN FUTURO MIGLIORE,AUGURANDOCI DI AVER TRASMESSO ,OTTIMISMO,SERENITA' E TANTA ENERGIA POSITIVA A TUTTI COLORO CHE ERANO PRESENTI PER CASO,E TUTTI COLORO CHE GUARDERANNO QUESTO VIDEO,CONDIVIDENDOLO"
VI INVITIAMO QUINDI A CONDIVIDERE IL PIU' POSSIBILE ! ! ! psy - gangnam style flashmob taranto,south of italy (piazza maria immacolata) kraftwerk - neon lights. taranto-foggia 06/07....indomabili!!!! 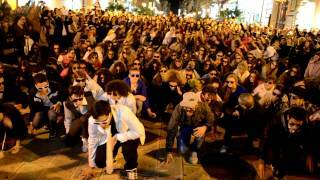 PSY GANGNAM STYLE flash mob in Barcelona SPAIN. British Army Soldiers Flashmob Gangnam Style!!! !